A hugely enjoyable and varied walk contrasting the limestone ravine of Trollers Gill with the gritstone outcrops of High Crag. After enjoying a nice little walk with the family in Coverdale in the morning this was my second outing of the day, taking advantage of the rare fine weather for an August Bank Holiday. Parking at the large layby on the B6265 just below Stump Cross Caverns my original plan had been to head up to High Crag. However, when I noticed that the head of Dry Gill was in fact dry I decided to add an extra couple of miles to the route so that I could revisit Trollers Gill. Just a few days earlier I’d attempted the gill with my daughter but had to turn back when heavy overnight rainfall made the path impassable. So instead of following the Black Hill Road track all the way up to its junction with Skyreholme Bank and Forest Road I took the signposted permissive path slanting down to Trollers Gill. After passing a ruined building and an old mining level, partly hidden by the bracken, I arrived at the path heading downstream into Trollers Gill. There was still a fair amount of water in the stream at this point but within 100 metres it had virtually disappeared underground. 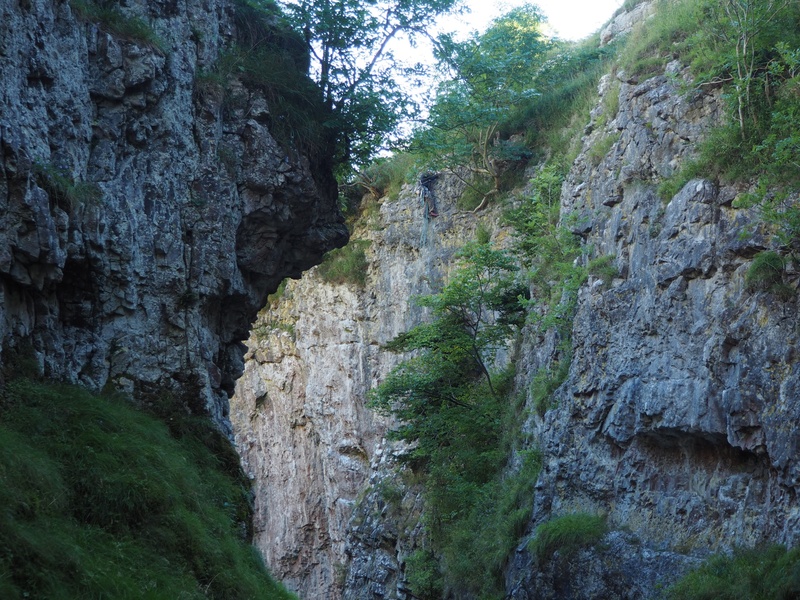 So it was that for the first time in three attempts I was able to descend into the main ravine of Trollers Gill. This was quite late in the afternoon and the sun was by now too low to illuminate the ravine. With no sunlight but clear skies overhead it gave the place a strange blue tinge which added to the ambience of what is one of the finest limestone gorges in the Dales. Finally emerging into sunlight at the southern end of the gill I followed the footpath above Skyreholme Beck, past the entrance to Parcevall Hall and on to the road at Middle Skyreholme. Turning left I commenced a gradual climb up Skyreholme Bank with the purple clad Simon’s Seat dominating the views to my right. Passing the junction with Black Hill Road I continued on the track, now called Forest Road for another mile before leaving it via a gate leading to a track passing a small building. It is worth noting that the actual right of way as marked on the map doesn’texist on the ground so it is better to take this quad track which leads nicely all the way up to within a few feet of the outcrop on the summit of High Crag, a hill which has the much more interesting alternative name of Rear Clouts. I’d only visited High Crag for the first time the previous summer and my regard for the place can be judged by the fact that I was returning again so soon. The substantial crags just below the summit make a fine place to linger and enjoy the view of this section of Wharfedale, which is exactly what I did. Eventually it was time to move on so I made my way northwards on easy grass heading for a gate on to the road about 100m to the right of Stump Cross Caverns. Rather than heading directly back to the car I decided to make a short detour up on to the limestone knoll of Nursery Knot. Here I settled down for the next 45 minutes to watch a lovely sunset over Grimwith Reservoir. A super end to what had been a hugely enjoyable day of walking.